Editor’s Note: This is the fourth installment of a new series called “Illuminations,” which aims to highlight stories of cooperation, unity and diversity from across the Cooperative Baptist Fellowship. Illuminations is a communications initiative of the Illumination Project, a project of discernment and accompaniment involving CBF congregational leaders to illuminate the qualities that have built unity in CBF, and through discernment, identify intentional processes to maintain and grow unity through cooperation. Learn more about the Illumination Project at www.cbf.net/illuminationproject. Remembering our transition to Slovakia 12 years ago as Cooperative Baptist Fellowship field personnel, I still smile at my naiveté about what to expect in the new cultural mix we would learn to love and call home. I recall thinking, “All these people look alike.” The most striking difference between the context we left— Central Arkansas—and what we moved into—Eastern Slovakia—was the absence of persons of African descent. For a month now, we have been back in the United States. We are reconnecting with family, churches, as well as attending required training events with CBF Global Missions. We are fortunate that Pulaski Heights Baptist Church in Little Rock, Ark., has a house they use for ministry which was made available to us to stay in. It just happens that the church is a few blocks from where I had attended middle school about 35 years ago. Since we routinely utilize short-term ministry teams in Slovakia and the Czech Republic to supplement the educational experience in schools, I figured I would go offer myself to my alma mater to see if there was anything I could do to support the good work of that school. I know the students he was describing. That was the world I grew up in. The church where Martin is pastor is already a mixed congregation where native Hungarian and Slovak speakers worship together. New to their beloved community was a Romany woman. She joined the church after her neighbor, compelled by the love of Christ, reached across presumed immutable cultural and social barriers in order to bear witness to Jesus. Unquestionably this is a reason to celebrate. However, this work of Holy Spirit challenged the church’s world view, causing them to question what God would desire from them next. Was the church ready to accept the other? How could they expand their cultural intelligence of the other in their midst? Cultural intelligence is the capacity to relate and serve in a cross-cultural setting. It would be a mistake to think cultural intelligence is required only of CBF field personnel who serve outside a North American context. Some of the greatest challenges in each of our contexts are how to maintain beloved community when we lack the capacity to understand the other in our midst. This is a challenge for churches, schools, police officers and for everyone who exists in a world with other people. Martin’s congregation wanted us to share about Romany history and cultures in order to know more about their neighbor. They sought to be informed by Scripture about the importance of cross-cultural, ethnic ministry. They also wanted some practical, concrete examples of how to minister with the Roma in their context. Entering into that conversation with them was an honor. The most provocative comment we made was the truth that the Romany peoples bear the image of God. Every person is an Image-bearer—not only those who look like me, speak like me, or view the world in the same way that I do. God’s design in and desire for creation is diversity. We will make sure to emphasize this truth as part of our stump-speech while sharing in churches over the next few months. In order for the church to continue to sustain beloved community, some things must be addressed. The church in every context and hopefully the world views of students at my alma mater were, are, and will be ripe for the possibility of change. *When the church set aside deacons to care for the ethnically diverse group of widows in Acts 6. Shane and Dianne McNary, native Arkansans, have served as Cooperative Baptist Fellowship field personnel since 2004. Their ministry is primarily but not exclusively among the Romany peoples in Slovakia and the Czech Republic. 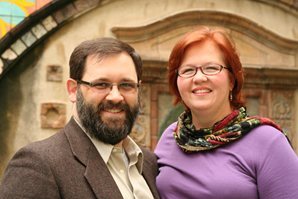 Learn more about the McNarys and how you can support their ministry here. Well said, Shane, well said.